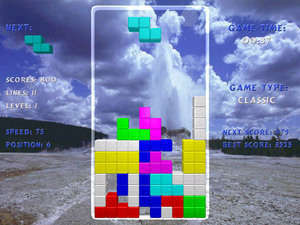 Tetris Arena is an ultra-modern 3D remake of the all-time classic Tetris game. This game will keep you playing for days on end because it comes with mind-boggling special effects, 12 ear-pleasing background tracks in stereo and addictive gameplay. Moreover, there are four different game variations to choose from: Standard, Advanced, Special and Crazy which were specially developed for players of various abilities and preferences. For security reasons, you should also check out the Tetris Arena download at LO4D.com which includes virus and malware tests. Additional screenshots of this application download may be available, too. Tetris Arena has a presence on social networks.